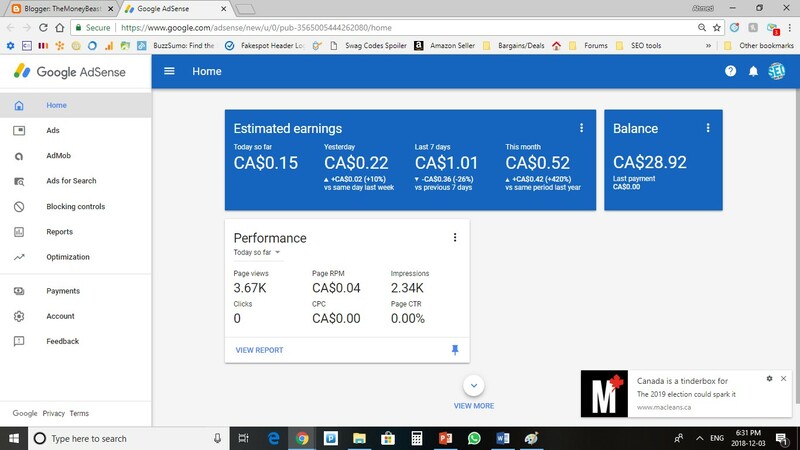 Yes I saw my earnings SKYROCKET with this method, I have not come across anyone online talking about this method as a way to increase your adsense revenue, let me say I have done my research regarding this issue and I believe it is more relevant to block the ad networks that are paying you very low than it is to block categories but don’t get me wrong I am not saying blocking categories will not increase your adsense revenue all that I am saying is using common sense blocking ad networks that are not paying or paying very low makes more sense and I personally have seen revenue increases and I will share the reasons why I believe blocking ad networks has an impact on your revenue. First let us start this is my adsense screen for last month, this isn't my main blog or income and yes I know it’s not a lot but as a blog starter it is at least something anyways let us get to the point so you wanna go to where it says “Blocking Controls” in the adsense menu shown on the left side. 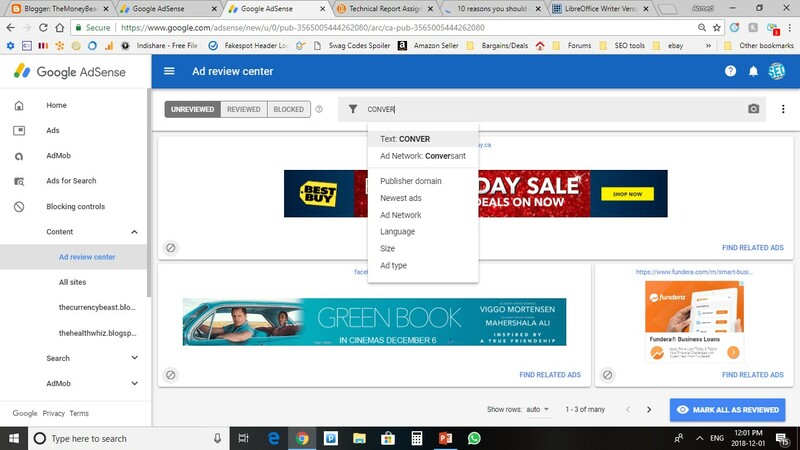 After you have gone to your “Blocking Controls” you have two options either to manually block ads one by one from the “ad review centre” which will probably take forever but in this post I will show you a different method, but before we start open a new tab and go to google adsense now I want you to open the “Reports” tab in the menu you will need this tab open to guide you on which ad networks to block. From here you are going to do your analysis on what ad is paying and which are not, you can go back by 30 days or you can go back by 7 days you wanna check on both and narrow down on the networks paying you nothing vs those paying 1 or 2 cents. 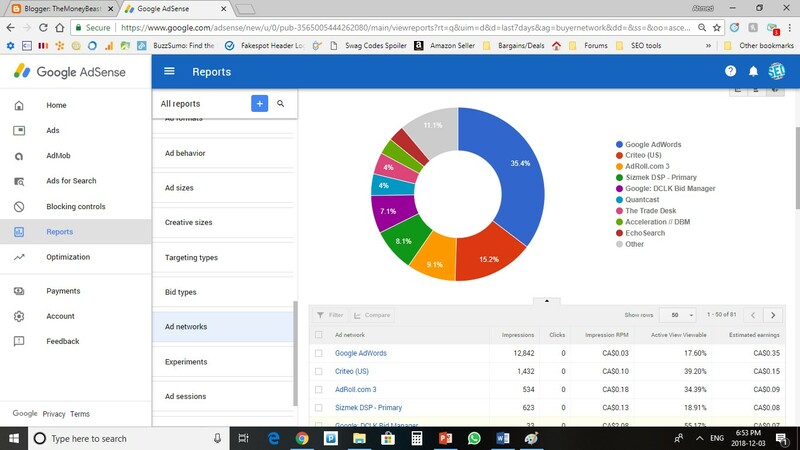 As you can see from the screen above below the graphical chart you have columns of ad networks, impressions, clicks, impression RPM, and estimated earnings and so on. Now here you wanna go step by step see the search bar on the right just above the ad networks here is where you put the name of the network you wanna block and that is pretty much all you need to know, I am assuming all of you reading this know how to follow basic instructions but if you are still confused or need direction just let me know I will try to have a youtube video done so you can see exactly how its done. 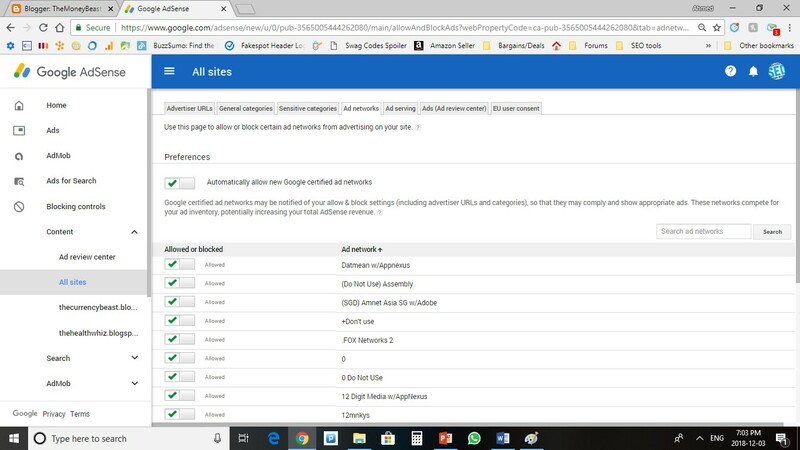 I did come across others sharing a list of advertiser urls to block normally 500 url's but do not do that you need to go to your reports and see what is not paying for you or paying you low it will have a greater impact on your revenue than arbitrarly blocking url’s without knowing what ad network it is for. To block ad networks from the ad review centre, open a separate google adsense tab and under the blocking section go to blocking < ad review center here you will search for the ad networks you want to block as you can see you have options to block by ad language, ad size, ad type and newest ads or the publisher domain you can experiment with them. Personally I have experimented with blocking all ad languages that are irrelevant to my blog since mine is English I have blocked all non English ads and that shot my earnings upwards of 40% but while it did have quite an impact it wasn’t the real problem and it didn’t make sense because my blog also gets traffic from several other countries that might find that ad relevant to them so blocking by ad language was irrelevant in my case. Having a look at the report going back to 30 days if an ad is paying you a few cents than you got a problem you need to block those ads reason why is because there also creating competition for other ads with possibly higher earnings and could fill up the view rate for such ads which is better for you because if your ads can’t be seen than no one would want to click on them, this method will skyrocket your ctr and you need to beaware of ads that are not paying at all for at least last 30 days and immediately block those ones. Just to note it is good to leave everything as it is before you start blocking for 30 days so you get a good idea what is paying and what isn’t paying or rather paying you a few cents. 1. Reason number 1 is your blocking ads which are not paying you at all, when I checked I saw I have several ad networks shown on my ads are not paying for the last 30 days than you need to get of them immediately. 2. Reason number 2 ad networks that are not paying are filling the gaps they are taking the space of other networks that are known to pay and if the user is not seeing those ads than they can’t click them. 3. Reason number 3 I have found that there are old networks or networks that have gone out of the game and are not being shown so you do need to manually remove them because that can cause the white space your seeing from ads and a drop in the viewability of ads and if their not viewed they will not receive clicks or impressions. Finally there are several ways and reasons and you need to experiment, experiment, experiment that’s the only way your gonna figure what works for your site, experiment with size, placement and categories but basically google adsense is smart and is almost always gonna show the relevant ads so but ad networks need to be manually blocked by you as shown in your reports there not earning you money or earning you little money. 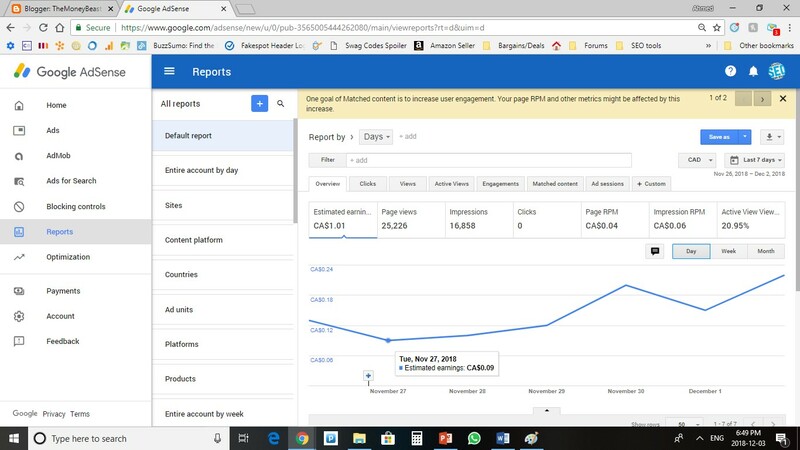 Also if you had experience with google adsense I am sure your aware of the fluctuating earnings that go up and down with this method I have actually seen that drop by 98% it hasn't happened as often as before so I believe blocking those network ads has a relating to the earnings going up and down. Feel free to reference, link and share, share, share this golden info.